Chickens, like most things in this world, tend to not listen to me. I have an o.k. time accepting this, since after all, they are chickens. They do give us eggs, and so I cut them a little slack about not following my instructions. But I think life would be easier for all of us if they’d just accept that I have a few ideas about things that might work. Take for example, going into the coop at night. When we first moved the chickens into the coop, it was summertime, and quite nice in the evenings. I can understand why they might have wanted to hang out on the roost in the run. However, doing this at night also struck me as putting up a billboard advertising a chicken dinner to the local nocturnal carnivores. They were protected, but it seemed like good practice to get them sleeping indoors. So how do you do this? 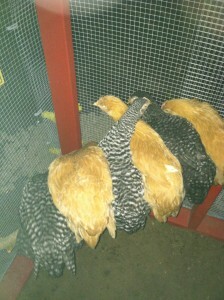 I did it by going out every night after dark and putting them in the coop by hand. The first night was the hardest. Not because I felt bad about doing it or anything, but because they had lined themselves up on the roost in order of alternating colors. Yellow chicken, black chicken, yellow chicken, black chicken, yellow chicken, black chicken. It was kind of adorable, but adorable does not trump safety, so I took a photo for posterity, then picked each of them up and put them in the coop. The next night, I did the same thing. The third night I only had to do it with four of them, as two had figured it out. Around this time, a friend told me I was wasting my time wrangling them and they would figure it out on their own. I have always felt that the chickens look to me as their god, and so I chose to be a benevolent and helpful one, and thus continued to show them the way. After about a week, they had it down. Their benevolent and helpful god smiled upon them. This same god has really reached his breaking point with the laying baskets, though. When you start looking at coop designs, there are loads of coops with really beautiful nesting boxes. Many of these allow you to just pop open the top of the box and get your eggs without having to open the coop at all. They jut out of the coop on one side, and function like an egg vending machine (as much as the chickens do). I knew the limits of my carpentry skills though, and instead went the route of using 5 gallon buckets for nesting. I was also going for “easy to clean” over “nice looking,” as I had a pretty good idea at that point that chickens were going to befoul anything they come near. People speak highly of buckets, and they’re cheap. “Oh you just go into a bakery and ask for them, they give them away they have so many,” was the line I heard often. Well, as an introvert, sometimes paying $50 for that bucket without having to talk to a stranger is preferable to just waltzing in and asking for free buckets. The Bucket Situation started to look bleak, until I remembered my friend Karyn ran a cafe. I emailed her and she said yes, they had buckets, and boy would they like to get rid of some. She said whoever was working would be overjoyed to clear out some space. So, I worked myself up to it, and told the guy behind the counter Karyn said I could have some buckets. He got a huge smile on his face, and eagerly asked, “How many do you need? Please, take them!” I took a few, some for nesting and others for chicken feed storage, and we were in business. 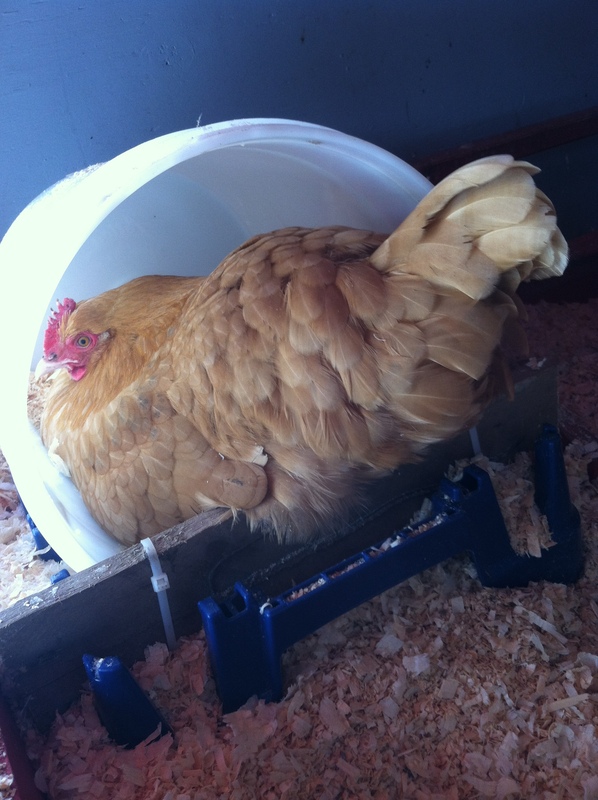 The chickens seem unimpressed with both the buckets and the lengths I felt I had gone to get them. When they first started laying eggs, they did it wherever the urge struck. I had to crawl under the coop a few times, and even wound up using a golf club to reach some in the far corners under there, which is the most I have used a golf club in years. Eventually they decided to keep it in the coop, but not the buckets. I took plastic Easter eggs and filled them with dirt (for heft) and put them in the nesting buckets to give them a hint of how this should go down. No dice. I can’t put the chickens in the buckets like I did with the coop at night, since I’m usually not around when they decide to lay their eggs. Their preferred spot to lay is either between the two buckets, or next to the roost, which is all but unreachable to anyone who doesn’t have ridiculous monkey arms like myself, and even I sometimes have to really stretch to get them. I suppose as long as they have a spot they like, they can use it. They tend not to poop where they lay, so that’s good. Not until I started writing this did they show any signs of using the buckets, and then almost immediately 4 of them used one bucket. So, anything to make me look bad seems to be the system. And then I wrote that other line, and they went back to laying out in the open. Chickens, man. Making a liar out of me. The last problem I had was with getting them back into the run after letting them out in the yard. Boy do they love the yard, and I can’t blame them, but safety calls, and so they have to go back in after a while. I used to have what I called my “chicken stick,” which was the wooden rod from our closet. I would hang out with it while chicken-sitting, and I felt like a shepherd, or a wizard, or a guy with a big stick. When it was time to go back in, I would use the stick to steer them back towards the coop, and then funnel them into the door. I probably looked ridiculous, but it worked. Then I bought a bag of mealworms at the feed store as a treat. For the chickens. This has thoroughly changed the dynamics of our relationship. If they so much as hear the bag crinkle, they won’t leave my side. I’m like the Pied Piper of chickens. So now, I let them do their thing, and when it’s time to go back in, I get the worm bag and they chase me back to the coop, and then fight over the handful of worms I throw inside. I think I have finally found a language they speak. This doesn’t work for everyone, though. I tried bribing my son with these worms but his language is still a mystery. And definitely don’t throw a bunch of them at your boss while requesting a raise. I don’t think I can stress that enough. But you know, chickens don’t listen to me, I don’t see why you should. 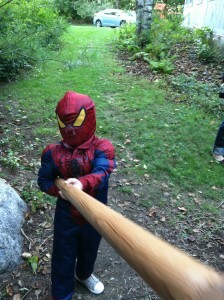 Spiderman demonstrates the “chicken stick”/ignores my pleas to stop poking me with said chickenstick. This entry was posted on Friday, February 15th, 2013 at 4:13 pm	and is filed under Backyard chickens, Chickens. You can follow any responses to this entry through the RSS 2.0 feed. You can leave a response, or trackback from your own site. Waaahahaha! Great post. Chickens, man.